After months of hard work, I'm excited to announce the launch of CompleteBankData.com! As many readers know, I'm an avid bank investor, the number of banks I own rivals the number of net-nets I own. The problem with banks is it can be hard to find comprehensive information quickly. There are SEC filings, FDIC call reports, and FFEIC filings, each needed to be examined separately and manually put into a spreadsheet. There was nothing that brought all these sources together in a simple, powerful, yet easy to use tool. We set out to change that. 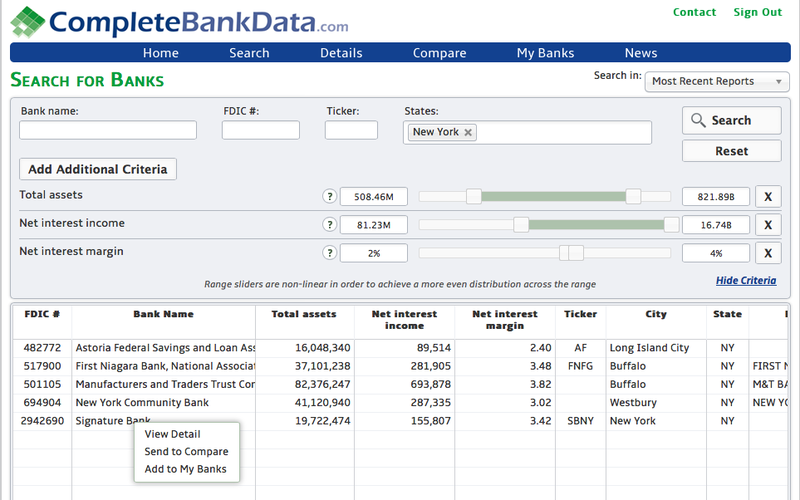 We designed CompleteBankData.com differently from the start, instead of building a platform for regulators we took regulatory information and put it at the finger tips of investors and bankers in a familiar format. 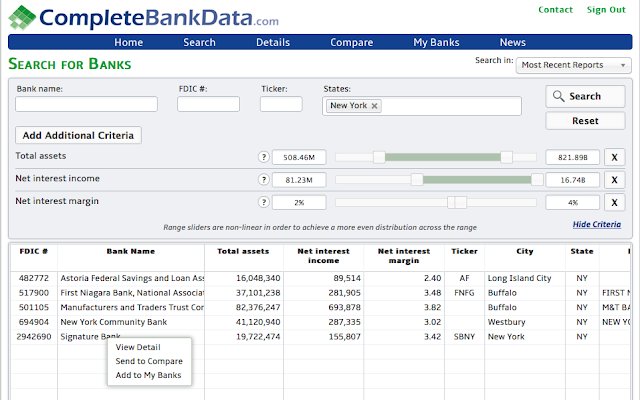 The site allows users to quickly sift through all US banks, both public and private, compare banks against each other on over 1,000 different industry specific metrics, and view a bank from the highest level, to the lowest granular view possible. I believe we have created the best platform for both bankers and bank investors. An investor can screen for new ideas, research regulatory and holding company financials, compare potential investments, and review SEC filings all without leaving the site. Our goal is to be your complete banking research solution. If you're interested in a free trial, I'd encourage you to register here. I want to walk through a few features that I feel set the site apart from any tool currently available. 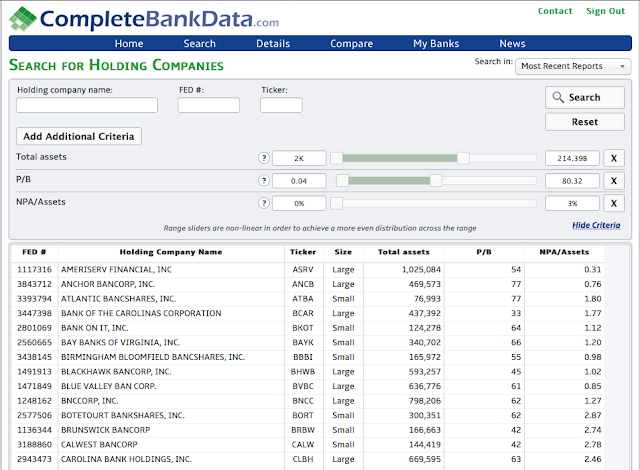 Screen using relative metrics and market data, find holding companies and banks below or above specific thresholds easily. Customize bank searches on over 1,000+ industry specific criteria. Are you looking for banks in Illinois that do $320-875k in auto lending, have less than $1m in commercial lending and more than 29 employees? We can do that, eight banks match..
Find everything from summary financials to the number of deposit accounts with a balance less than $100k. 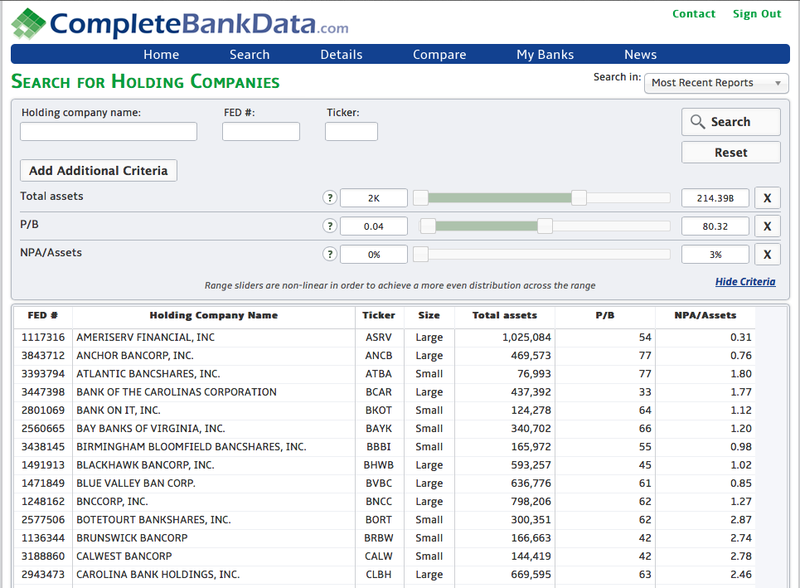 Detailed performance ratios and statistics for both banks and holding companies. We have all the data to help you make better decisions. 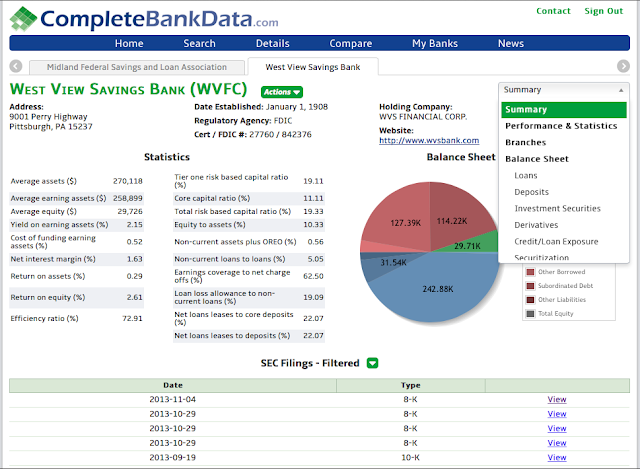 Quickly compare an unlimited number of banks on more than 1,000 industry specific criteria. Save off interesting banks to the My Banks page for further research later. Save banks to the My Banks page for later viewing. 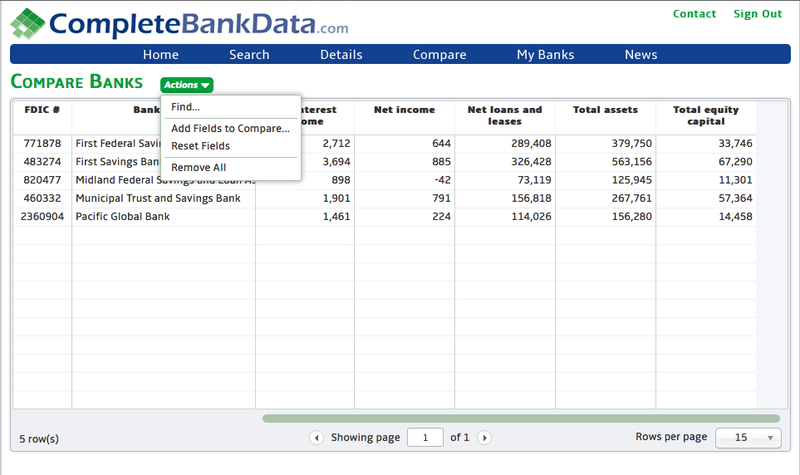 Organize and categorize banks simplifying your workflow. We didn't just build a website, we built a platform for bank investing. By focusing on building an extensible and re-usable platform we have built flexibility in from the start. From data feeds via an API, to completely customized screens the sky is the limit. I believe we've built a tool that will change how investors research banks. Powerful, detailed, yet accessible. 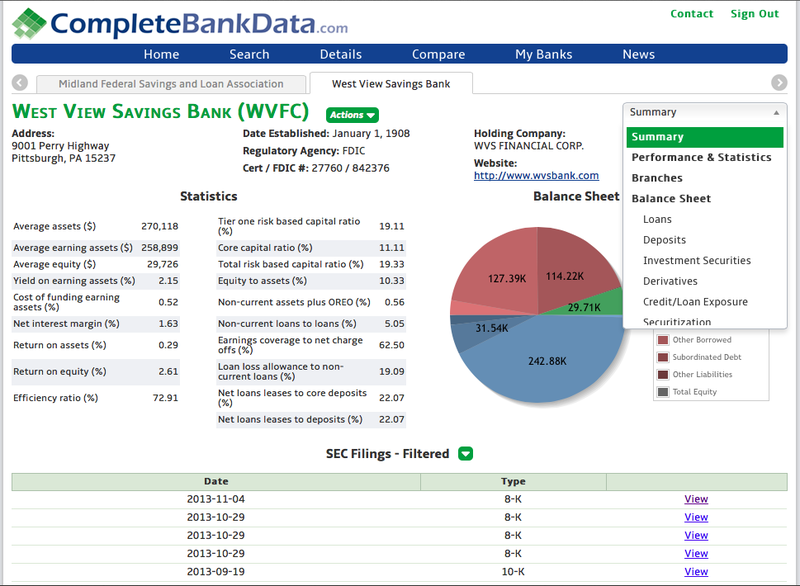 If you're interested and would like more information register for a free trial, or contact me here (info @ completebankdata.com). Thanks, we think so as well. Whats the difference between this and SNL finanical? 1) The search and compare tools are much more powerful than what SNL provides. 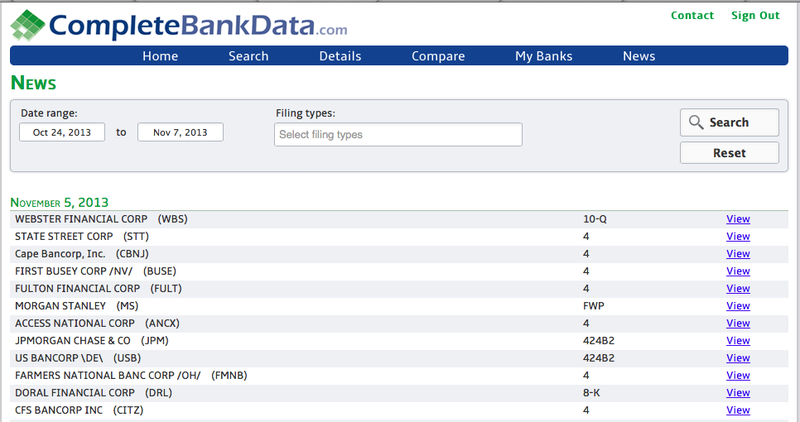 2) There are a lot of gaps in SNL's data for smaller banks, we don't have the same gaps. For the smallest banks we have information that SNL is missing. 3) Our site is much easier to use, it's simpler and better looking, you don't waste as much time trying to find a piece of data. 4) SNL has priced themselves in a way that they're inaccessible to most small-medium sized banks, and any mutual/hedge fund that isn't financial specific, we are not. This looks great, Nate. I like that the layout is so clean and uncluttered. I'm eager to give this a try and see if it's as great as it seems! I poked around on the site, and it is almost SHOCKINGLY easy to navigate. I wish all the systems I use were this user friendly. Good stuff! Truly well done! what is pricing on this tool? 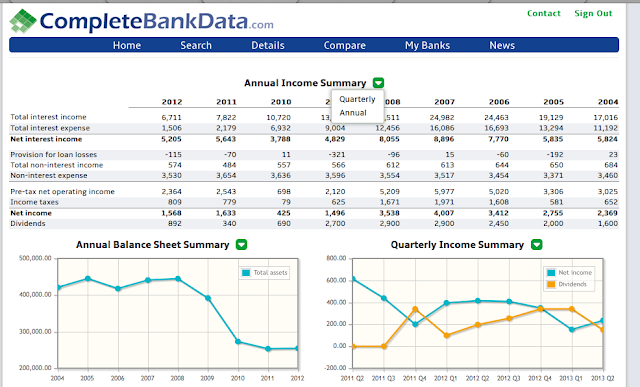 Send me an email about ntobik AT completebankdata.com and I can get that to you. Thanks!